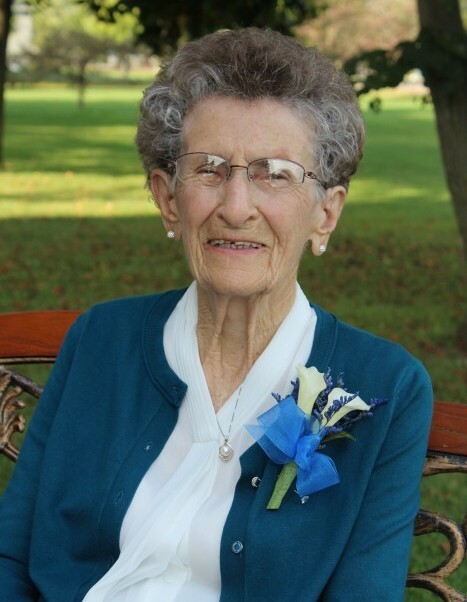 Virginia Dolores “Gini” Wermund, 91, of Chippewa Falls, died peacefully at the Chippewa Manor Nursing Home and Rehabilitation on Wednesday, February 6th, 2019, surrounded by her family, and under the care and comfort of St. Joseph’s Hospice. Virginia was born in Chippewa Falls on September 25th, 1927, the third of 15 children born to Christine (Swoboda) and Henry Schemenauer. While growing up, Virginia attended Hillside country school through the eighth grade. At age 15, she moved to town to work at the St. Joseph Hospital, and then later at the Chippewa Woolen Mill, where she met her future husband, Warren A. “Wormy” Wermund. They were married on November 4th, 1947, at St. Charles Borromeo Catholic Church in Chippewa Falls, and celebrated more than 63 years together prior to Warren’s death on December 7th, 2010. Virginia worked as a nurse’s aide at St. Joseph’s Hospital for 18 years, followed by 22 years at the Northern Center. The couple resided in Tilden most of their married life and moved to the Chippewa Manor Retirement Community in 2009. Along with her family, nothing was more important to Virginia than her faith. She was a devoted member of St. Charles Catholic Church where she was always willing to volunteer at funeral luncheons, church picnics, in the church office and baking for shut-ins. Weekly Bible Study, Friday morning Masses at the Manor, and sharing her time and talents for the Sojourner House were also important to her. Virginia enjoyed socializing with others at the Manor and participated in many of the activities there. She especially enjoyed being a member of the Spud Club, playing Scrabble, Bingo and cards, tending to her raised garden, and occasional bus outings. One of her greatest life-long joys was cooking and baking, especially for others. With seemingly little effort, she could prepare the best of holiday meals, care packages for family, treats for her neighbors, and potato dumplings for Manor bake sales. Virginia may have been small in stature, but she was strong in fortitude, humility, and selflessness. She always put others before herself. She worked nights, and with very little sleep, raised six young children. Immediately after the tornado of ‘58, she walked in rain and lightning to get help for her family. She never let a snowstorm be an excuse for missing work, many times walking a mile or more to catch her ride. She sacrificed to give her children a Catholic education. She always made a point to serve others before herself, and when the neck of the chicken was the only piece left, she convinced her children it was her favorite piece. With her strong character, her tough spirit, and her moral compass, she was a shining example of the Beatitudes. Virginia was always very proud of her family and treasured the time they would spend together. Those who are celebrating her life, as well as cherishing her memory, are her six children, ten grandchildren, four great-grandchildren, and two great-great-grandchildren: Lyle (Sue) of Darien, WI, and his children, Brian of OR and daughter, Simone; Tanya and children, Whitney (fiancé Nicholas Sylke) and their children, Bruce and Jason, and Darren Comer of CA; Jennifer (Andy) Lehr of IA; and Danielle, of CA; Ann (Clark) Loeffel of Kronenwetter, WI and their daughter, Gina (Ritik) Singh, of NC; Dave of Chippewa Falls, WI; Steve (Marcie) of Kronenwetter, WI, and their children, Emily (fiancé Adam Ludwig), of Eau Claire, WI and Addy (Brady Gregurich) of MN; Mary (Jerry) Jacobson of Chippewa Falls, WI, and their children, Todd (Mary) of AZ and daughter Teresa, and Beth (Jacob) Leahy of Chippewa Falls, WI; and Jane (Jim) Ford and their son, Jaren, of GA.
She is further survived by siblings: Patricia Bohl, Elizabeth Bowe, Carol (Steve) Bohl, all of Chippewa Falls; Henry (Evelyn), Richard (Diane), Charles, and Daniel Schemenauer, all of Chippewa Falls; and sisters-in-law, Rose and Edna Schemenauer, and Betty Bohl of Chippewa Falls. Additionally, Virginia is survived by a “special niece,” Grace Ann (Jan) Van Dreser, and many other nieces and nephews, treasured friends, relatives, and neighbors. In addition to her parents and her husband, Virginia was predeceased in death by her great-granddaughter, Aria Wermund; her mother- and father-in-law, Einar & Gena (Haugen) Wermund; twin brothers, Francis and Frederick in infancy; brothers, Gerald, Kenneth, Francis “Pretzel”, Greg and Thomas Schemenauer; brothers-in-law, Bob Bohl, Wally Bowe, William Waege and Lloyd Wermund; and sisters-in-law, Karen, Pat and Dolores Schemenauer, Eleanor Waege, and Florence Wermund. The Wermund Family would like to acknowledge Dr. Mary Kuehl, St. Joseph’s Hospice, and the caring staff of the Chippewa Manor, especially Rev. Robert Hoekstra. Virginia’s life will be celebrated with a Mass of Christian Burial at 10:30 a.m. on Saturday, February 16th, at St. Charles Borromeo Catholic Church, 810 Pearl Street, Chippewa Falls, WI with Msgr. Michael Gorman and Fr. William Felix concelebrating. Burial will be in Calvary Cemetery, Chippewa Falls. A rosary will be recited at 4:00 p.m. on Friday, February 15th, at Pederson-Volker Funeral Chapel, 44 E. Columbia Street, Chippewa Falls. Visitation will follow until 8:00 p.m. with a Vigil Service at 7:30 p.m. Family and friends may also call from 9:30 to 10:15 a.m. on Saturday at Pederson-Volker Funeral Chapel. In lieu of flowers, memorials are preferred to a charity of donor’s choice.